Michelle Rivera Is A Proud Brand Ambassador For The All Natural Drink Cobá Aguas Frescas! I’m excited to share with my readers that I am now a Brand Ambassador for the all natural drink Cobá Aguas Frescas! I’m looking forward to working with Cobá and to introducing them to all of you because of the high quality that Cobá brings within each of their products. Generally there are only three or four ingredients, including water, organic agave nectar, and a base of either tamarind, mango, hibiscus or guava. No artificial sweeteners or preservatives whatsoever! Diabetic, vegan and diet friendly! Agave nectar is a 100% natural sweetener (derived from the agave plant) with a significantly lower glycemic index than white sugar, corn syrup or honey. Aside from being 100% gluten free, it does not prompt high blood sugar spikes and is less likely to trigger your body’s mechanism for fat storage when ingested. 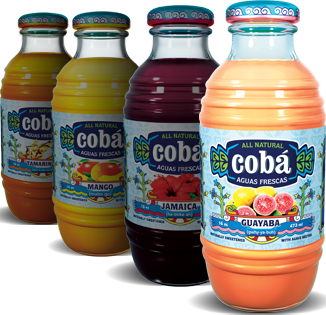 Cobá Aguas Frescas is lighter than your juice nectar, but heavier than your enhanced water, creating a perfect thirst quenching blend! Now everyone can see why I am so proud to work with this brand. So you may be wondering what exactly will I be doing as a Brand Ambassador with Cobá Aguas Frescas? Well as an Ambassador I will be attending events and in-store demos to share with you all the information about this delicious, healthy drink, as well as give you the opportunity to try it! So be on the look out for my tweets and Facebook messages where I will be sharing what store or events I will be at to share Cobá Aguas Frescas with you! I would love to see your beautiful faces there! LIKE Mommyhood to Hollywood on Facebook! LIKE Cobá Aguas Frescas on Facebook!